People have been suffering from insomnia and restless sleep long before iPhones and Instagram. However, now that many of us are reachable 24/7 – which makes shutting off from work all the more difficult – and we’re constantly scrolling through social media before bed, getting the proper shut eye we need has become even harder. It’s no surprise more and more people are investing in their well-being – we’re talking not just in terms of fitness, yoga and meditation but also in ancient healing therapies, crystals, aromatherapy candles, herbal teas and indulgent wellness product such as jade facial rollers and heated eye masks. As much as we can try to hide the fatigue and after another night of restless sleep (thankgodfor concealer), it’s better to try and treat the cause rather than a short fix for the symptoms. Filled with lavender, essential oils and medicinal herbs targeting insomnia, these trendy beauty products will have you focusing on beauty from within by inducing a much-needed good night’s rest. We’re loving this indulgent home upgrade from Vitaclean HQ. The shower head (HK$600) unit comes with filters, which not only work to get rid of the limescale and chlorine content in your water, but also essential oils for an aromatic and nourishing experience for your skin and hair. Opt for the Lavender Filter (HK$135) to help you unwind at night. Other blends include Coconut Vanilla, Rose, Original Citrus, Lemon Mango and Jasmine. Sometimes falling asleep isn’t the problem, it’s staying asleep. The de Mamiel botaniques Sleep Series is comprised of two parts: Sleep, which is made up of Settle, Soothe and Anchor blends, and Awake, which contains the Rise and Shine blends. Anchor (HK$420) is a hand-blended mix of herbs, watermelon seed oil and passionflower oil, containing Magnesium, Zinc and B Vitamins essential for quality sleep, and calming lavender, sandalwood and frankincense oils. It literally acts as an ‘anchor’ for your mind and nervous system, helping to induce calmness and a sense of stillness. Inhale it deeply and apply it to your wrist and décolleté to help release tension. 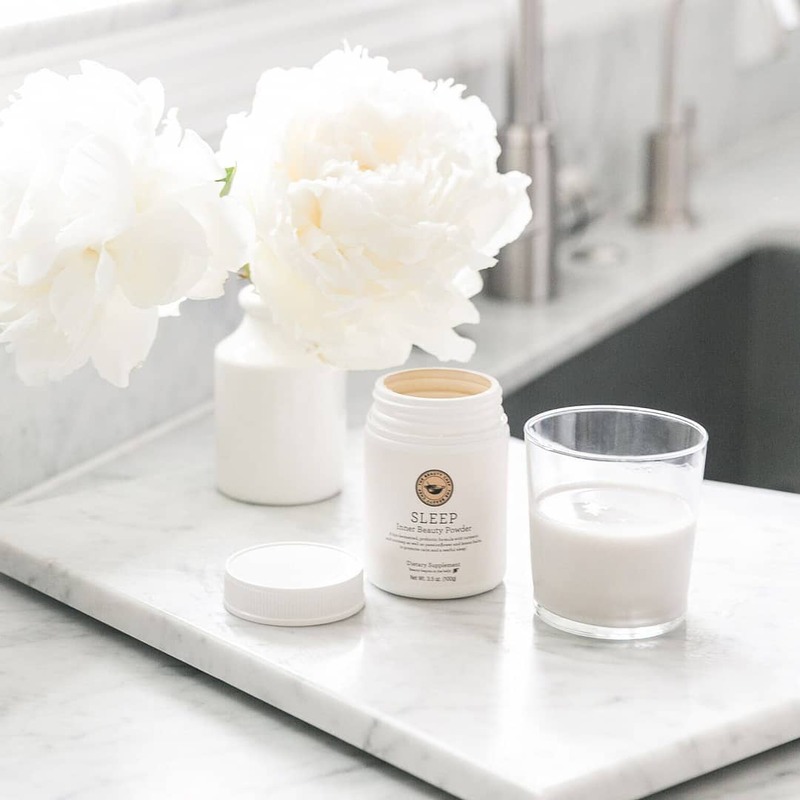 Cult Australian wellness brand, The Beauty Chef, was one of the first to convince people to approach beauty via the inside out through nutrition with their ‘Glow Inner Beauty Powder’. We’ve also heard great reviews of their Sleep Inner Beauty Powder (HK$310). Mixed with warm milk (of your choice), this calming concoction of superfoods and probiotics such a turmeric, nutmeg, passionflower and lemon balm will help to promote restful sleep. If beauty powders aren’t your thing, skip the coffee and brew a cup of WelleCo’s The Super Elixir Sleep Welle Fortified Calming Tea (HK$355) before bed instead. Sleep contains an all-natural blend of skullcap, valerian root, hops, lemon balm, passionflower and mango flour. Valerian root and skullcap are both medicinal plants used to treat insomnia and anxiety. Hops works in conjunction with valerian, as a mild sedative. It’s great for your hair and skin, hopefully, your sleep. Eye masks may seem like just a hedonistic product for those who like to be a bit extra at home or on the plane while they’re sleeping. However, eye masks do actually help you to fall and stay asleep. Your brain produces melatonin when it senses pure darkness and unless you have blackout curtains at home, this can be a simple way to help you sleep. Our favourite is the Slip silk eye masks (HK$357) made from mulberry silk, which is supposed to also prevent damage and the appearance or winkles in your face while sleeping. If you’re looking to splurge, you’ll love the Aromatherapy Associates Relax & De-Stress Collection: Lavender Holistic Silk Mask & Muscle Gel Set (HK$800) available exclusively on Cathay Pacific flights. The eye mask is filled with natural lavender and sits comfortably against the skin. This list wouldn’t be complete without This Works’ bestselling pillow spray (HK$225) Spray it onto your pillows, bed area or eye mask and let their award-winning Deep Sleep fragrance (a mix of lavender, vetivert and chamomile) work its magic.